1. Peel potatoes if skin is tough, otherwise just scrub and rinse them. 2. Cut each potato into thin slices but not all the way through. Use a handle of spoon to prevent knife from cutting all the way. 3. Put potatoes in baking dish and fan them slightly. 4. Sprinkle with Mrs. Dash and drizzle with butter. 5. Bake at 425 degrees for about 50 minutes. 7. 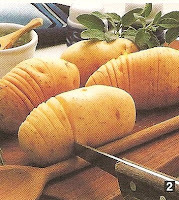 Bake potatoes for another 10-15 minutes until lightly browned, cheeses are melted and potatoes are soft on the inside.